This article is 3191 days old. Have you had a hard time lately getting to Famous Players’ Silver City? Walker Road between Legacy Park Drive and Highway 401 is torn up for major reconstruction. 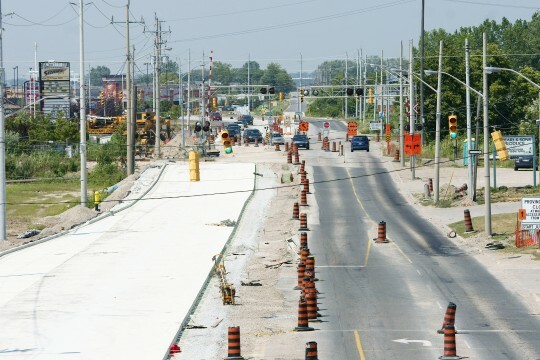 The road and nearby railway crossing are being widened along with new watermains and sewers. One side of traffic is already completed — freshly paved with concrete — and the other lanes are up now. Construction in this area parallels work on the 401’s overpasses, being prepared for the new border solution. Coco Paving is reconstructing Walker Road. As well, Coco has repaved the entire 401 from Tilbury to Windsor. Dillon Consulting provided consulting to the project.